Influenza A viruses are broadly categorized by two proteins they carry on their surface; their HA (hemagglutinin) and NA (neuraminidase), resulting in subtypes like H5N1, H7N9, or H3N2. Within each subtype there are genetic groupings called clades, and often within each clade - subclades – and within each of these, many variants may exist. Between continual antigenic drift, host adaptations, and repeated reassortments, the family tree of HPAI H5 has become very complex. The (clade 0) HPAI H5N1 virus that appeared 20 years ago in Hong Kong has been long replaced by a series of newer, more `biologically fit' versions. 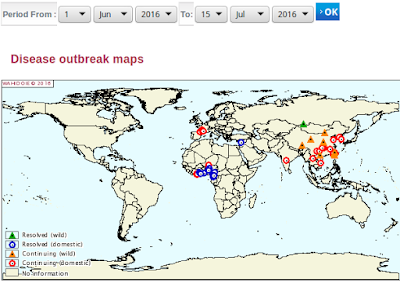 Clade 1 viruses which appeared in 2003 - mostly in Vietnam, Cambodia & Thailand - have now given way to clade 2 viruses around the globe (see WHO chart at top of this blog). In 2005, during the first major expansion of H5N1 beyond Southeast Asia, we saw a massive die off of birds at Qinghai Lake in China (see H5N1 Influenza Continues To Circulate and Change 2006 by Webster et. al.). Suddenly, and unexpectedly, waterfowl (brown headed gulls, cormorants, ducks, geese, etc.) died by the thousands from the H5N1 virus. What emerged at Qinghai Lake - and quickly spread into Europe, Africa, and the Middle east - was clade 2.2 (aka QH05) of the H5N1 virus. In 2009 researchers found evidence of another clade (2.3.2) (see 2011 EID Journal New Avian Influenza Virus (H5N1) in Wild Birds, Qinghai, China), which was detected in dead birds in the same region. In short order the 2.3.2 clade began to show up in migratory birds, and poultry, from Japan to India, supplanting the old 2.2 clade in many regions. While clade 2.2.1.2 viruses circulate widely in Egypt and clade 2.3.2.1a are occasionally reported in India and Bangladesh, the two HPAI H5 clades making the biggest moves are clade 2.3.4.4 and clade 2.3.2.1c. Both pose formidable threats to the poultry industry, and both appear unusually well suited for long-distance carriage by migratory birds, but clade 2.3.2.1c is perhaps the most worrisome as we've seen suggestions that it is accruing `mammalian' adaptations. In December of 2013 a nurse from Alberta returned from a trip to China while infected with this clade of H5N1, and exhibited atypical (neurological) symptoms before she died. The following summer in the EID Journal: Potential Human Adaptation Mutation of Influenza A(H5N1) Virus, Canada, researchers reported on two novel mutations (R193K and G225R) found in the HA sequence that have previously been associated with changes in virulence or receptor binding affinity. In January of 2015 we saw another `Qinghai-like' die off of birds in China (see H5N1 Detected In Swan Die Off In Henan Province) which was subsequently identified as clade 2.3.2.1c (see Novel H5N1 Reassortment Detected In Migratory Birds - China). As we saw in 2015 (see There Ain’t No Cure For The Summer Bird Flu), the level of summer avian flu activity is once again elevated compared to year's past, and a substantial portion of that appears to be due to clade 2.3.2.1c. Which brings us to a new study that suggests that clade 2.3.2.1c may have `gained a selective advantage in migratory birds', thereby increasing its threat. A novel Clade 2.3.2.1c H5N1 reassortant virus caused several outbreaks in wild birds in some regions of China from late 2014 to 2015. Based on the genetic and phylogenetic analyses, the viruses possess a stable gene constellation with a Clade 2.3.2.1c HA, a H9N2-derived PB2 gene and the other six genes of Asian H5N1-origin. 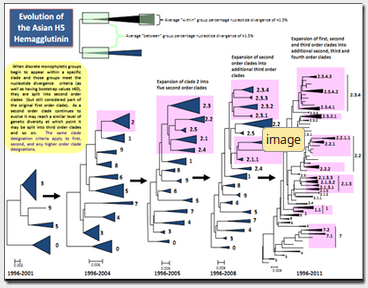 The Clade 2.3.2.1c H5N1 reassortants displayed a high genetic relationship to a human H5N1 strain (A/Alberta/01/2014). 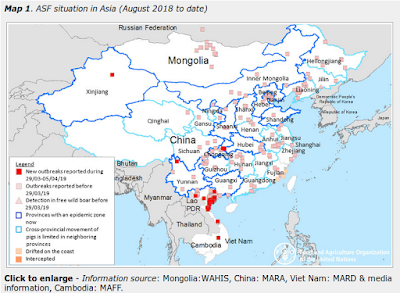 Further analysis showed that similar viruses have been circulating in wild birds in China, Russia, Dubai (Western Asia), Bulgaria and Romania (Europe), as well as domestic poultry in some regions of Africa. The affected areas include the Central Asian, East Asian-Australasian, West Asian-East African, and Black Sea/Mediterranean flyways. These results show that the novel Clade 2.3.2.1c reassortant viruses are circulating worldwide and may have gained a selective advantage in migratory birds, thus posing a serious threat to wild birds and potentially humans.